We are asked to perform one of Burt Bacharach’s songs “My Little Red Book” for the upcoming film “What’s New Pussycat?” Recording is taking place in Abbey Road Studio 2. I am a bit nervous because Burt, one of the great songwriters, will be arriving at some point during the recording to be sure we do it right. We start before Burt arrives, and after one a short time I see that the great man is there in the control room, with the glamorous actress Angie Dickinson at his side. I have learnt the piano part, it’s not difficult: all I have to do is play some chords over and over on each beat of the bar. Easy peasy. I can do this in my sleep. Or can I? After the first take we go to the control room to listen. It is OK but something isn’t 100%. We wait for a comment from the great Burt, who asks me if I could play it more evenly, without accents. I am playing “klang KLANG klang KLANG” – playing beats 2 and 4 louder than beats 1 and 3. This is instinctive to me as a jazz player, trying to inject rhythm into the part. Nowadays as a more Pop/Rock player the more even style of playing would be natural for me. Burt wants it unaccented, so we do another take, and I try to play it more evenly without success. We listen back and Burt tactfully says that it is an improvement, but needs to be played even more evenly. At this point, I overhear Angie Dickinson saying how tired she and Burt are after being up late at a party with Princess Margaret, and I see her sneakily looking at her watch. It is becoming obvious that the other guys are doing fine and I am the one holding up the session, and keeping the tired Burt and Angie from their bed. I start feeling pressured by the situation, which doesn’t help my playing much. After another failure on my part, Burt tactfully suggests that maybe we should play the part together, 4 hands on the keyboard, with him at the bass end, and me playing the treble part. Angie sighs. So out we go and try again. Burt at the bass end plays nice and evenly, and me at the treble playing “klang KLANG klang KLANG”. It is getting worse, because I am now self conscious the the timing is beginning to suffer as well, this time in an attempt to cover my playing. Burt says “Manfred, why don’t you play at the bottom and I’ll play at the top end?” “OK Burt.” I say, feeling humiliated because I cannot get the hang of this, simple though it is, and Angie is now in the background, rolling her eyes to the heavens. Once again we go back into the control room and listen; my posture begins to resemble someone who is clinically depressed. I know full well that it is no good, and all I want is want a hole to disappear into. “Yes Burt,” I reply meekly as the whole room breathes a sigh of relief, and the beautiful Angie relaxes. Burt then plays it beautifully. It should have ended there, yes it should… but Burt, being a very nice kind man, tries to protect my dignity and give me a role to play. He pretends to be interested in my opinion. “Manfred what do you think – is it OK?” “Yes Burt,”’ I say with a faint and grateful smile. 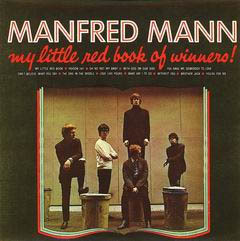 The record is finally released as Manfred Mann, not mentioning Burt’s piano playing and ignoring my part as music critic in the corner of the control room. I met Burt again in 2004 and I told him the story. He was so generous. He said that it was a difficult piano part. © Manfred Lubowitz. All rights reserved.